Whether you’re three or ninety-three, the thing we all love about Christmas is the sparkle! Festive lights twinkling on the tree, the soft glow of a traditional lantern, or outdoor lights outlining the roof of your home all manage to lift the spirits and engender that hint of excitement that Christmas can’t be far away, writes Nicci Gow. These days the range of lighting for both inside and outside your home is huge, and choosing the right set of lights may seem a daunting task. Although you can pick up a basic set of traditional lights almost anywhere, you will find that one of the best places to find a comprehensive range of lighting – and advice on what to choose and how to fit it – is your local, independent, garden centre. Garden centres have been selling Christmas gifts and decorations for many years and have a wealth of knowledge about creating brilliant light displays to add a festive feel to your home. And of course, these days, lighting isn’t just about strings of lights for the tree or outside of your house. Wooden, lit churches; angels; individual baubles; music boxes; wreaths; garlands and candle bridges – all designed to give you that Christmas glow! Many are battery-operated, making it easy to add some extra sparkle wherever you want it, and often include a timer, so they are on to welcome you home in the evening and you don’t need to remember to switch them off at bedtime. So generate some Christmas magic this year and create that extra bit of theatre with a few additional lights. And remember, outside lighting adds just as much sparkle to a summer evening’s garden party as it does to Christmas, so investing in outdoor lighting will give pleasure all the year round, not just at Christmas. Oh! 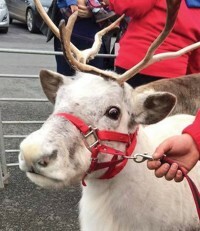 And talking of Christmas magic – don’t forget that Santa and his real reindeer will be at Fresh @ Burcot Garden Centre on Saturday December 3. Phone or check the Facebook page for details. Nicci Gow and her husband Neil are co-owners of Fresh @ Burcot Garden Centre.